A former supporter of France's far-right National Front party (FN) has gone on trial for helping a man she met in the Calais migrant camp cross the border to Britain. Béatrice Huret is charged with aiding an illegal border crossing after she bought a boat for her partner, an Iranian man named Mokhtar. He and two others successfully crossed the English channel with her help. Mrs Huret is facing up to 10 years in prison if she is convicted. 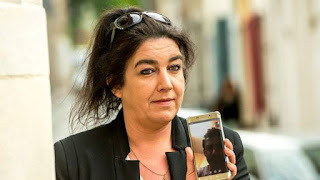 One issue being considered by the court is whether Mrs Huret, the widow of a border police officer, was part of an organised people-smuggling organisation. Three others are facing the same charges. "I know what I did," she told reporters outside court on Tuesday morning, but added that her actions were "out of love". Her main concern would be not seeing Mokhtar if she was imprisoned, she added, as she regularly visits him at his new home in the UK. Her lawyer told the AFP news agency she would ask the court to dismiss the case because she had acted for "humanitarian reasons." Mrs Huret admitted that for Mokhtar, she would do it again, reporters at the French court said.